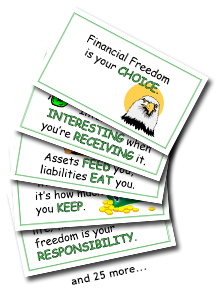 Get a set of all 30 of the financial wisdom princples printed and laminated on 11 x 17 in FULL COLOR today for your group or classroom. They are amazing to teach from, have conversations and lessons around. Even adults will ask you about them. These business card size Money Principle Cards feature all 30 of the Creative Wealth Principles we teach in our Camp Millionaire camps and curriculums. They’re a great way to get the ‘money conversation’ started with your kids and teens, or even between a couple just learning about money. Cards are available printed or as a downloadable PDF you can print and cut at home on card stock. Life’s Little Wealth Principles are 52 of the most powerful financial habits and principles used by financially free people everywhere. The cards will remind you daily of the little things you can do to move yourself forward in any way you wish! Order your own set of Life’s Little Wealth Principles today. They make great gifts also!.